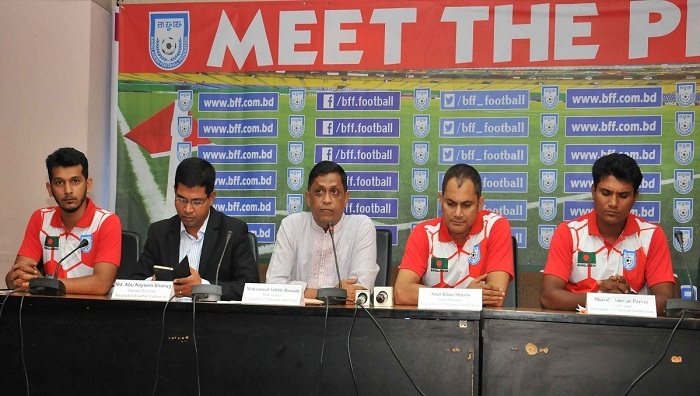 The 32-member Bangladesh Football team will fly for Nepal Tuesday morning to participate in the six-nation SAFF U-15 Championship beginning on Thursday at ANFA Complex in Kathmandu with an initial target of reaching semifinals. Two arch-rivals--India and Pakistan—will play the inaugural match on Thursday (October 25) at 11:30 am at the same venue while the Maldives will face hosts Nepal in the other opening day’s fixture at 3:30 pm. All the South Asian countries except Sri Lanka are taking part in the meet. Bangladesh Team leader Mohammad Sabbir Hosain and Team Manager Amit Khan Shuvro also spoke on the occasion. Bangladesh team comprises 23 players and nine officials. Pakistan, which is put in Group B with India and Bhutan, will play Bhutan at 11:30 am on October 27 while India will meet Bhutan on October 29 at 11:30 am. Ahead of the SAFF, Bangladesh U-15 team made their practices here on Monday. Bangladesh women’s emerged champions in the SAFF U-18 Women’s Championship in Bhutan early this month while another Bangladesh Women’s team now in Tajikistan to play in the AFC U-19 Championship qualifiers and this is the time for Bangladesh U-15 boys’ team to make agood result in Nepal.